Fortman, Bas de Gaay. (1393). Peace With Justice: The Grounds of Human Rights From a Faith-Based Perspective. 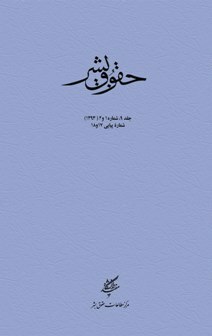 دوفصلنامه حقوق بشر, 09(1), 47-59. Bas de Gaay Fortman. "Peace With Justice: The Grounds of Human Rights From a Faith-Based Perspective". دوفصلنامه حقوق بشر, 09, 1, 1393, 47-59. Fortman, Bas de Gaay. (1393). 'Peace With Justice: The Grounds of Human Rights From a Faith-Based Perspective', دوفصلنامه حقوق بشر, 09(1), pp. 47-59. Fortman, Bas de Gaay. Peace With Justice: The Grounds of Human Rights From a Faith-Based Perspective. دوفصلنامه حقوق بشر, 1393; 09(1): 47-59.